Please report to JASRI the amount of beamtime actually used the quantity of liquid He/He gas provided by JASRI for each visit with this form. Based on this report, the resulting user fee is determined. Please write your requests and suggestions for improvement, and advice to other users as well. As the general rule, these requests and feedbacks will be posted on the Beamtime Report Search. Project leaders must prepare an experiment summary report (Form 26) summarizing the analytical results obtained from each experiment performed at the SACLA. 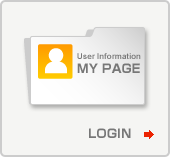 Please log in to the UI site My Page and submit it online within 60 days after completion of the experiment. Please provide the report title, first author, co-authors, report body including purpose of the experiment and summary of the results (attach images), type of publication, journal title, and expected date of publication. If it is not clear when you publish your results, check the box for “Undecided Publication Date” and provide the reason and/or the tentative plan. Otherwise, the report may not be submitted. Two weeks after the report submission deadline for the last experiment of the term (60 days after the end of each half-year research term + two weeks), submitted experiment summary reports will be incorporated into the experiment summary report database with search capabilities and made available on the UI site. 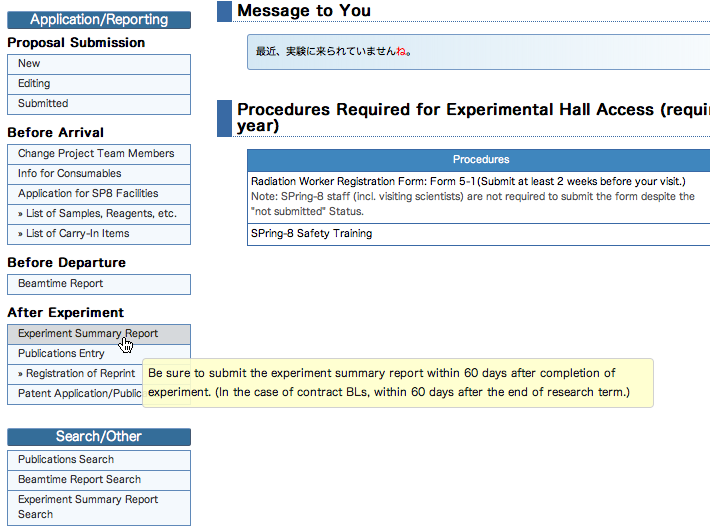 Please submit your experiment summary report from the User Information Website (UI site) My Page. Please log in to My Page first with your user card ID number and password, and select “Experiment Summary Report” from the menu (Fig. 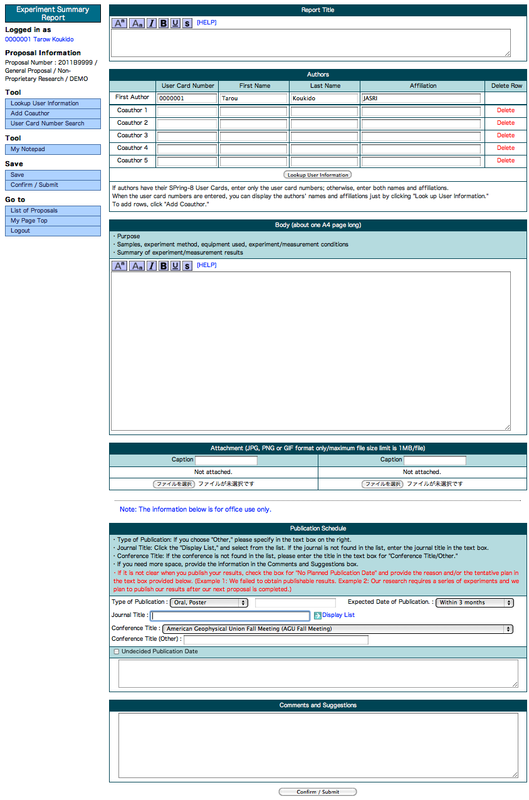 1), and the online form will display (Fig. 2). Required fields consist of report title, first author and coauthors, body, attachment, and publication schedule. Report Title: You can use special characters as well. Body: The body should be about one A4 page long. Please be sure to include the following information. Attachment: Acceptable file formats are JPG/JPEG, GIF, and PNG. Choose the type of publication from the pop-up list displaying several options: Refereed Journals, Review Articles, Proceedings, Books, Awards, Patent, Other, Invited Talks, and Oral/Poster. If you choose “Other,” please specify in the text box on the right. For the Expected Date of Publication, choose when you plan to publish your results from the pop-up list displaying several options: Within 3 months, Within 6 months, Within a year, Within 2 years, and Over 2 years. To enter the journal title, click the “Display List,” and select from the list. If the journal is not found in the list, enter the journal title in the text box. 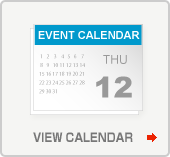 In the case of a conference, choose the title of conference from the pop-up list. If the title is not found in the list, please enter the title in the text box for “Conference Title (Other).” Please note that if this box is left blank, the report cannot be submitted. If it is not clear when you publish your results, check the box for “Undecided Publication Date” and specify the reason(s) and publication plan in the text box provided below. We are interested in your comments and suggestions on improvements to our service so that we may better serve the user community. Please take a few moments to let us know how we are doing.